A 60-year-old white male presents to your office with a 20 year history of daily heartburn, acid regurgitation and intermittent dysphagia. 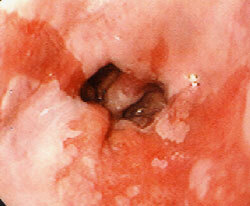 His endoscopy is shown in the figure. Biopsies confirm the presence of specialized intestinal metaplasia with low grade dysplasia. The best medical regimen for treating his problem would be.